The Cape Hatteras Lighthouse is located on Hatteras Island in the Outer Banks of Buxton, North Carolina and it's made of brick and stands 208' tall. 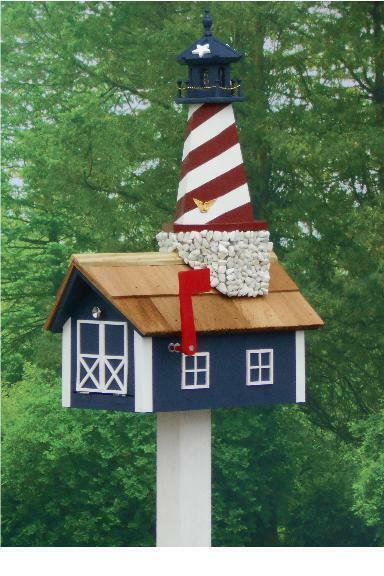 Here you can have your own replica of the Cape Hatteras Lighthouse in this lovely lighthouse/mailbox duo. The mailbox is made of fir wood with a cedar shingle roof. You can choose your lighthouse colors with black, hunter green, navy blue and red all available. Amish made with electric light that shines from your lighthouse! Please email or call with any questions about our mailboxes or any of our Amish furniture. Additional colors are available for this lighthouse mailbox and a Furniture Specialist will be happy to assist you in customizing this item with colors that best match your outdoor decor. Thank you for shopping with DutchCrafters. 22 1/2" x 14 1/3" x 33"